If you wish to sell items at the show, please go to our vendor page. For more information, please feel free to email us at info@caextreme.org. If you are interested in bringing games, please click here. So you've got a game that you want to show off (or sell)? Here's some information you should know and keep in mind. While it's not absolutely required to register the games you're bringing, it helps us in laying out a floorplan and coordinating setup times. A lot of time and effort goes into planning the show each year, including making a floorplan that flows well and makes a more enjoyable environment. We also need to submit a general floorplan to the fire marshal one month in advance. Knowing what people are bringing helps us pick what else to bring so we can get the best possible variety. Please click here if you are interested in bring games. For any game or other items brought to the show for exhibition or show, the owner must have a legal license or right to display it. Non-licensed equipment should not be desplayed at the show. Multigame modified games must be set to only display/play games for which the owner has the legal right. Be set at a reasonable volume. Be in reasonably good shape overall (exceptions may be made for rare games). Have an accessible on/off switch and power cord. *If not on free play, exterior credit switches are encouraged, or the game owner should keep credits on the machine throughout the show. Please make sure all games have a proper power cord with no bare wires exposed complete with a 3-prong plug if required. Access to the inside of the games must be restricted. All doors and openings must be secured to ensure the equipment's and everyone's safety. Make sure no unusual pointy or sharp things are protruding from the game which endangers other players and games. Please pay special attention to broken feet (levelers). They damage the floor and the show does get charged for this damage. If your game has any fragile elements that may require extra care or attention, please let a staff member know. Games may be removed starting at 5 pm Sunday though we request you leave them until 9 pm if possible. We understand sometimes an exhibitor can't stay for the whole show. If you cannot stay until 5 pm Sunday, please let us know in advance so your game can be placed to minimize disruption when removed early. If you sell a game, be aware of the early removal policy. If the game leave on Saturday, a $20 fee applies, if it leaves before 5 pm on Sunday, a $10 fee applies. By signing this form, you agree to the Exhibitor Requirements above and agree to indemnify California Extreme if not followed. Free raffle ticket for the special Exhibitor's raffle for each game brought. Free T-shirt for bringing a 4th game! So why not bring that extra 4th game (or more) and get that T-shirt? And if you have never brought a game or games previously, again, this is the year to make the effort! :) Not only will you be rewarded for your efforts with all of the above, but sharing these classic gems with a very appreciative audience is truly a nifty reward in itself. Again, if you bring three (OR MORE!) pre-approved games to the show, you can get a free admission. Games should be available for others to play for the entire weekend. 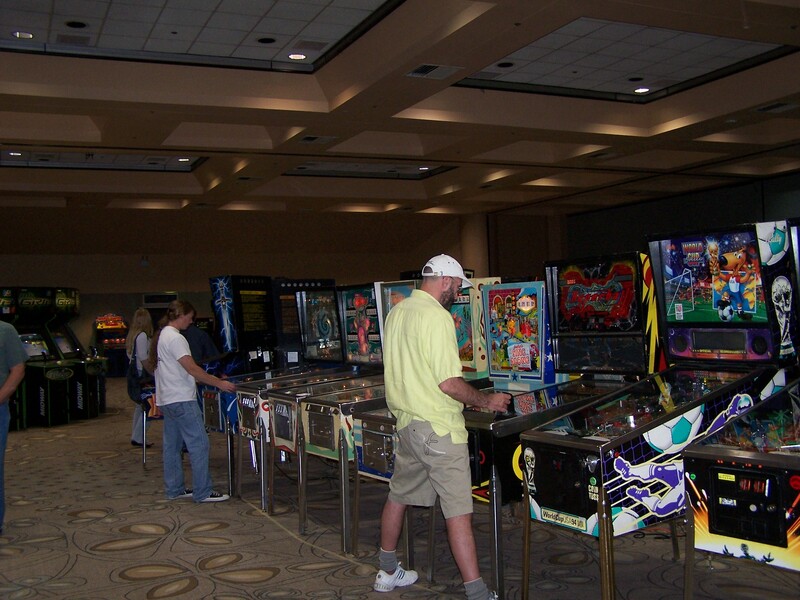 To keep the show fun for everyone, games that are used for free admission must stay on the show floor until 5 PM Sunday. If you can only attend part of the show and must remove your games early, adjustments may be required (see the early removal policy below). Let us know your situation and we'll work out a fair deal. Discounts on admission are available for one or two games as well, so if you can't bring three, you can still get credit for pitching in. Games used toward free admission must be pre-approved, please contact us in advance. While we understand that games do break, a show of broken games isn't fun for anyone. Please be prepared to make a reasonable effort to keep the games in playable condition throughout the show. We understand that sometimes a game will not be reasonably repairable at the show, just be prepared to do your best. If you're bringing lots of games to sell, you may want to inquire about vendor space. Bring 2 electro-mechanical games and get in free. Games must be pre-approved by contacting us, and in good working order. All the fine print for bringing three games applies. Games should arrive early enough to be placed in the floorplan. We will be there starting early Friday morning. Please take this into account when planning your arrival. If you can schedule a drop-off time in advance, it would be greatly appreciated. Games may be removed as of 5 pm Sunday, although, we request that you leave them until the show closes at 9 pm. The show floor will be open for game removal Sunday night until midnight, and all day Monday. The following policies apply to games on the show floor that are for sale or have been used toward free admission. Early removal fees do not apply to games in vendor area (ask about vendor space rates). Games should be available for play throughout the entire show, although we understand early removal may be necessary if, for example, you can only attend the show for one day. In reasonable cases, let us know in advance, and there is no fee (We reserve the right to determine what a reasonable case is, but don't worry, we don't bite!). $20 fee per game removed before midnight on Sat. $10 fee per game removed before 5PM on Sun. If you can only make it to the show one day, and still want to bring games, you're encouraged to! Contact us to make special arrangements before the show.